Highlights from our AMC sessions! 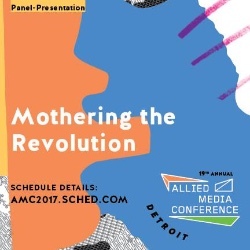 We had a few incredible sessions at the Allied Media Conference in Detroit from June 15-17, 2018. We are happy to share highlights from a couple of the sessions below. In the Mothering the Revolution session facilitated in partnership with Cecilia Caballero of Chicana M(other)work, participants offered vulnerable reflections and strategies for what “Mothering the Revolution” meant to them. Special shout out to the folks who took a courageous leap and recorded for our live podcast (Shayla, Phuong, Alisha, and Alicia)! To listen to Cecilia and I debriefing of the session and the share out from the attendees, click below! In our Parenting for Liberation lunch meet up, about 20 parenting folks came to break bread with me (literally) and sharing stories over a meal. Much appreciation for the folks who opened up, went deep, and shared of themselves. Respect for the parents who asked questions and sought guidance of the collective, and deep gratitude to the fellow parents who shared strategies and offerings to uplift fellow parents. The African proverb says it takes a village to raise a child, and it felt good to find a village at the AMC. Parenting for Liberation podcast on iTunes!